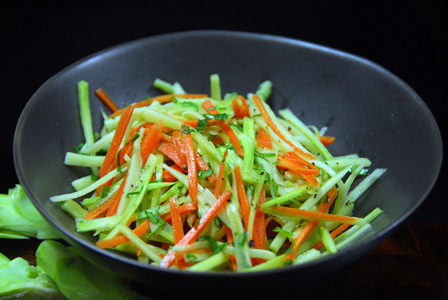 Cucumber is sliced into 2 inch long pieces and mixed with raw mango julienne. The mixture is finally seasoned with cumin seeds oil and herbs. 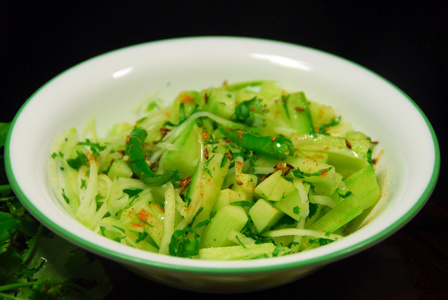 Serve cucumber mango salad sprinkled with chaat masala. Makes: around 2 Servings of Cucumber Mango Salad. Peel, wash and julienne the raw mango. Wash, remove skin, discard seeds and slice the cucumber into around 2 inch long pieces. Heat oil in a pan, add cumin seeds and green chiles. Fry till cumin seeds change color, remove from heat. In a mixing bowl, mix together sliced cucumber, raw mango, cilantro, above cumin seeds and green chiles and salt. Sprinkle chaat masala and serve cucumber mango salad immediately. Notes: Make sure not to burn the cumin seeds. Suggestions: Adjust spice with green chiles. Make sure to add salt and chaat masala just before serving if you are planning to refrigerate the chopped cucumber. Variations: Add finely ground black pepper and few drops of lemon juice if you wish. Other Names: Cucumber Mango Salad. Fresh strawberries are layered over a handful of baby spinach leaves and drizzled with freshly made honey dressing. 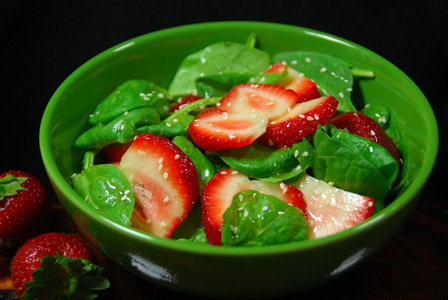 Chill for few minutes if desired and serve spinach strawberry salad immediately. Makes: around 2 Servings of Spinach Strawberry Salad. Whisk honey, vinegar and olive oil and keep aside. Wash and strain the baby spinach leaves. Remove stems, wash and slice the strawberries. In few serving bowls, add baby spinach leaves, sliced strawberries, sesame seeds and pour little bit of freshly prepared honey dressing on top. Serve spinach strawberry salad immediately. Notes: Refrigerate spinach and strawberries before using. Suggestions: Adjust honey according to your preference. Variations: You can also add sliced onion if you wish. Other Names: Spinach Strawberry Salad. Moth beans are soaked and pressure cooked and briefly fried in little oil. It is then mixed with chopped vegetables and onion soaked in lemon juice. Serve moth beans salad immediately before moth beans turn cold. Makes: around 2 Servings of Moth Beans Salad. Heat oil in a pan, add cooked moth beans and pinch of salt. Fry on medium flame till any leftover moisture is evaporated. Remove from heat and transfer moth beans to a mixing bowl. Wash and halve the grape tomatoes. Soak onion lemon juice and pinch of salt and keep aside. 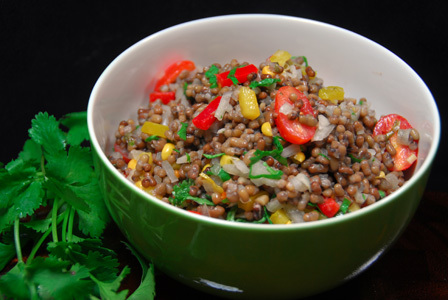 In a mixing bowl, carefully mix moth beans with bell peppers, corn, grape tomatoes, onion, cilantro, black pepper and salt. Adjust any seasonings if required and serve moth beans salad immediately. Notes: Make sure not to overcook moth beans. Suggestions: Soak raw moth beans in water for around 4 – 6 hours and pressure cook in twice the amount of water for 2 whistles. Variations: You can also serve the salad over lettuce wraps. If using regular tomatoes in place of grape tomatoes, make sure to remove the seeds before chopping the tomato. Other Names: Moth Beans Salad. Broccoli stem is thinly sliced along with carrot. It is then mixed with lemon juice and seasonings. Serve broccoli slaw as a salad or as a stuffing in burger. Makes: around 2 Servings of Broccoli Slaw. Peel the outer layer of the broccoli stem and thinly slice the broccoli stem. Julienne the broccoli slices and keep aside. Peel, wash and thinly slice the carrot. Julienne the sliced carrot. In a mixing bowl, mix all the ingredients and adjust any seasonings if required. Leave the broccoli slaw aside for atleast 30 minutes. 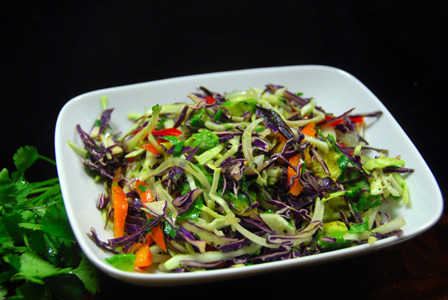 Serve broccoli slaw as a salad. Notes: Make sure chop the broccoli and carrot of same size. Suggestions: Add a pinch of sugar if required. Variations: Add your choice of vegetables (onions, peppers etc…) to the broccoli slaw. Red and green cabbage are thinly shredded. Choice of bell peppers is thinly sliced along with onion. These ingredients are mixed with diced avocado and seasonings along with lemon juice for a quick and crisp cabbage avocado salad. Serve cabbage avocado salad immediately or refrigerate for later use. Makes: around 4 Servings of Cabbage Avocado Salad. Chop half of the avocado into small chunks. In a mixing bowl, mix together all the ingredients. Serve cabbage avocado salad immediately or refrigerate for later use. Notes: Make sure not to leave the cabbage avocado salad outside for a long time. Suggestions: Adjust the amount of ingredients to your preference. Variations: Lightly mash the avocado so it sticks better to the cabbage. Your choice of nuts can also be added. Other Names: Cabbage Avocado Salad.